Last Friday night I turned to my favourite staples for post work drinks. I am obsessed with faux leather trousers and have got so much wear out of them yet again over the past few months. They are truly a great basic to have in your wardrobe and I’ve enjoyed experimenting with different ways to wear them over the past few years. So I thought I’d share a few ideas here today! 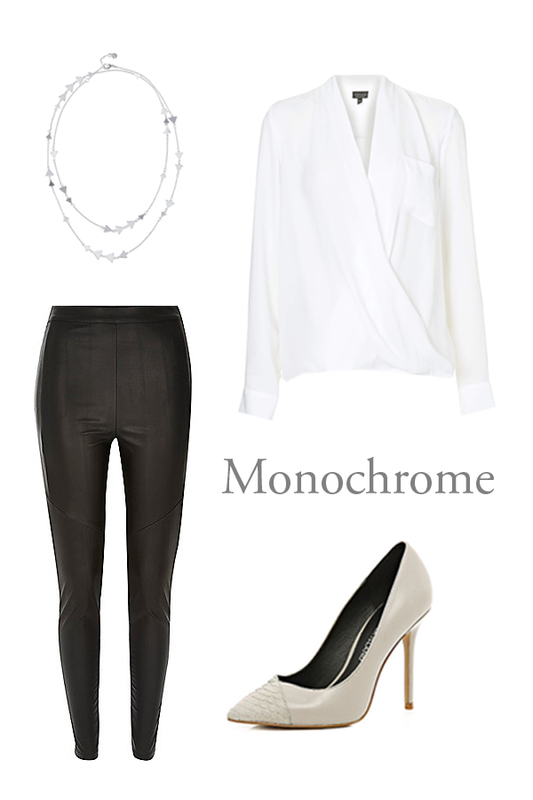 First up is monochrome with my exact Topshop blouse. This is another great, versatile piece. I wore it with jeans during the day and threw on the trousers after work. Mine are from H&M but I’ve found a similar pair in River Island for all three looks below. I also love teaming leather with knitwear as it looks so luxurious. This off the shoulder jumper is a perfect option for an evening out and I’ve finished it off with my latest shoe purchase from Kurt Geiger. And now into new territory! There’s no denying that trainers have become trendy lately and I’ve seen lots of street style posts teaming luxe leather with runners. I love the idea of dressing them down with loose tees and long cardigans. And I’m so tempted to give the runners a go! My sister has a pair of these Nikes below, so I’ll definitely be nabbing them to try before I buy. Watch this space! Hope you enjoyed today’s roundup and found some inspiration. With Spring still seeming so far away, I certainly won’t be packing my leathers away just yet!